It's funny that most people dress up as the dude on the cover of Skyrim, because that armour is terrible. Let's get a little more creative, people. 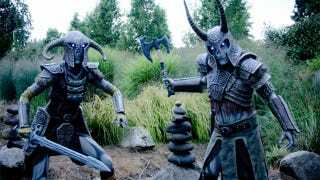 Like these folks, who dressed up as a couple of the Draugr Deathlords. When I say "folks", I mean one of them is props genius Bill Doran, who we've featured before here, because he does damn fine work. The other is his wife. What a cute couple. Are Game (Sniper Rifles) Art? Those wanting to see how stuff like this is done, Bill's done a great writeup on his blog showing how the suits were made.